In these lessons, we will learn	about inverse variation and how to solve applications that involve inverse variation. The following diagrams show Direct Variation and Indirect Variation. Scroll down the page for examples and solutions. There are many situations in our daily lives that involve inverse variation (indirect variation). For example, the number of days required to build a bridge is varies inversely to the number of workers. As the number of workers increases, the number of days required to build would decrease. xy = k where k is a non-zero constant, we say that y varies inversely with x. Suppose that y varies inversely as x and that y = 8 when x = 3.
b) Calculate the value of y when x = 10. Suppose that y varies inversely as x 2 and that y = 10 when x = . a) Find the equation connecting x and y .
b) Find the value of y when x = 3. How to define inverse variation and how to solve inverse variation problems? 1. y varies inversely as x. y = 4 when x = 2. Determine the inverse variation equation. Then determine y when x = 16. 2. The time, t, required to empty a tank varies inversely as the rate, r, of pumping. If a pump can empty a tank in 2.5 hours at a rate of 400 gallons per minute, how long will it take to empty a tank at 500 gallons per minute? 3. The force, F, needed to break a board varies inversely with the length, L, of the board. If it takes 24 pounds of pressure to break a board 2 feet long, how many pounds of pressure would it take to break a board that is 5 feet long? 4. y varies inversely as the square root of x. y = 6 when x = 16. Determine the inverse variation equation. Then determine y when x = 4. How to solve a basic inverse variation problem? y varies inversely as x. y = 3 when x = 10. Determine the inverse variation equation. Then determine y when x = 6. How to solve an inverse variation problem with a change of variables? Given m varies inversely as t, and m = 9 when t = 6, find the variation constant and the inverse variation equation. Then determine m when t = 27. How to solve a inverse variation problem when k is a fraction? y varies inversely as x. y = 1/2 when x = 2/3. Find the variation constant and the inverse variation equation. Then determine y when x = 2/15. 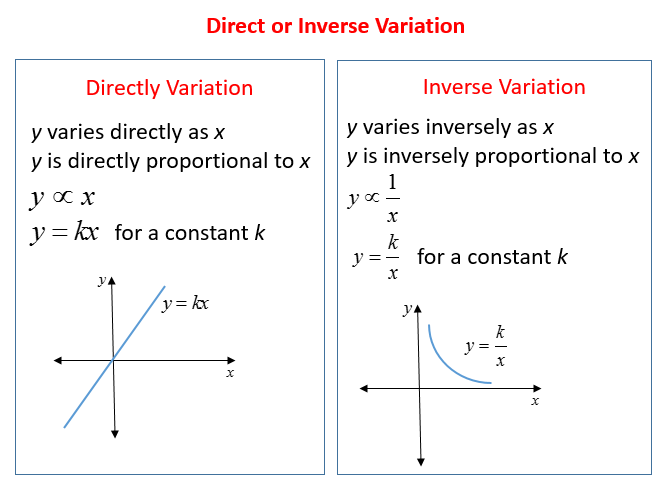 What is the difference between direct and inverse variation? In general, if two quantities vary directly, if one goes up so does the other. If one goes down so does the other. • y varies directly as x. • y is directly proportional to x. • y = kx for some constant k.
In general, if two quantities vary indirectly, if one goes up and the other goes down. • y varies indirectly as x. • y is inversely proportional to x. • y = k/x for some constant k.
How to tell if two variables vary inversely or directly? How to solve direct variation and indirect/inverse variation word problems? On a string instrument, the length of a string varies inversely as the frequency of its vibrations. An 11-inch string has a frequency of 400 cycles per second. Find the constant of proportionality and the frequency of a 10-inch string. This video looks at inverse variation: identifying inverse variations from ordered pairs, writing inverse variation equations, graphing inverse variations, and finding missing values. Example: Let x1 = 4, y1 = 12 and x2 = 3. Let y vary inversely as x. Find y2.